Demonstrators crowded Bryant Park Saturday afternoon to call on President Donald Trump to release his tax returns. Trump has refused to release his tax returns, citing an Internal Revenue Service audit, since the days of his presidential campaign. The Tax March, which began at 1 p.m., featured a mascot of sorts in the form of a giant inflatable rooster bearing Trump’s golden hairdo. Participants marched from Bryant Park to Trump Tower, carrying signs and chanting, "No more secrets, no more lies. Show your taxes, show your ties." Scroll down to check out more scenes from the march. Comedian and actress Sarah Silverman speaks to protesters at Bryant Park during the Tax March on April 15, 2017. Protesters rally at Bryant Park on Saturday, April 15, 2017, calling on President Donald Trump to disclose his taxes. Protesters hold signs calling on President Donald Trump to release his tax returns during a march in Bryant Park on Saturday, April 15, 2017. Protesters at Bryant Park rally against President Donald Trump's decision to not release his tax returns on Saturday, April 15, 2017. Sherri Tiesi, of Mount Vernon, joins thousands calling on President Donald Trump to release his tax returns during a march on Saturday, April 15, 2017. Politicians, including Manhattan Borough President Gale Brewer, NY State Sen. Brad Hoylman and Public Advocate Letitia James, march demonstrators calling for President Donald Trump to release his tax returns on April 15, 2017. Protesters call on President Donald Trump to release his tax returns on Saturday, April 15, 2017. Similar marches were held on Long Island, Washington, D.C. and near Trump's estate in Palm Beach, Fla. Protesters march up Sixth Avenue on Saturday, April 15, 2017, to call upon President Donald Trump to disclose his tax returns. Protesters rally outside Bryant Park for the Tax March on Saturday, April 15, 2017. Protesters rally at Bryant Park during the Tax March on Saturday, April 15, 2017. Comedian Sarah Silverman speaks to protesters at Bryant Park during the Tax March on Saturday, April 15, 2017. Actress Kate Walsh was also at the march. Thousands of protesters rally at Bryant Park during the Tax March on Saturday, April 15, 2017. Protesters rally at Bryant Park during the Tax March on Saturday, April 15, 2017. Demonstrators called on President Donald Trump to share his tax returns. Comedian Sarah Silverman speaks to protesters at Bryant Park during the NYC Tax March on Saturday, April 15, 2017. Thousands of protesters gather outside Bryant Park on Saturday, April 15, 2017, calling on President Donald Trump to release his tax returns. Two opposing tax march protesters hold signs on Sixth Avenue on Saturday, April 15, 2017. 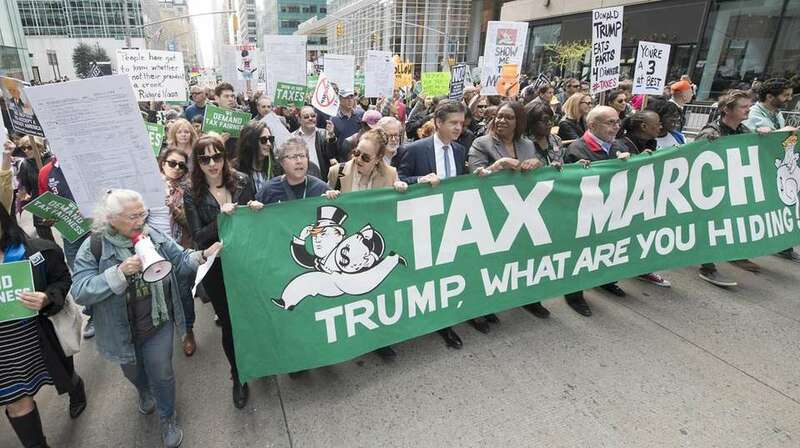 Protesters marched up Sixth Avenue, calling on President Donald Trump to release his taxes Saturday, April 15, 2017. Protesters in the tax march go up Sixth Avenue on Saturday, April 15, 2017. Demonstrators called on President Donald Trump to release his tax returns. Comedian Sarah Silverman joins protesters at Bryant Park calling on President Donald Trump to show his tax returns on Saturday, April 15, 2017. Abby Stokes holds her protest sign as she supported marchers going down Sixth Avenue on Saturday, April 15, 2017. Protesters rally at Bryant Park, asking for President Donald Trump to disclose his taxes on Saturday, April 15, 2017. David Bomke, who lives in New York City, joins protesters on Sixth Avenue during the tax march on Saturday, April 15, 2017. Protesters march up Sixth Avenue calling on President Donald Trump to disclose his taxes on Saturday, April 15, 2017. Protesters gather outside Bryant Park to call for President Donald Trump's tax returns on Saturday, April 15, 2017. Thousands participate in the tax march in midtown on April 15, 2017. Thousands take part in the NYC Tax March on April 15, 2017, calling on President Donald Trump to release his tax records. Comedy writer Frank Lesser speaks at the start of the NYC Tax March on April 15, 2017, in Bryant Park. With him is the Trump chicken. Demonstrators march from Bryant Park to Trump Tower on Fifth Avenue, calling for the president to release his tax returns on April 15, 2017. Demonstrators take part in the NYC Tax March on April 15, 2017, calling on President Donald Trump to release his tax records. Demonstrators gather in Bryant Park on April 15, 2017, for the NYC Tax March. Thousands begin a march from Bryant Park to Trump Tower on April 15, 2017, demanding President Donald Trump release his tax records. Protesters fill the streets in midtown, calling for President Donald Trump to release his tax returns on April 15, 2017. Demonstrators gather at Bryant Park on April 15, 2017, for the NYC Tax March, demanding President Donald Trump show his tax records. Thousands march in midtown Manhattan on April 15, 2017, demanding that President Donald Trump reveal his tax records. Many said they want to know who he represents. Protesters call on Trump to release his tax returnsSpeakers, including comedian Sarah Silverman, questioned what Trump is hiding. Where the cluck did this chicken come from?Here's how a statue in China became a logo for the upcoming Tax March. Groups protest Trump's border wall national emergencyHere’s a look at upcoming demonstrations and protests planned in the city.